Qingdao (Agenzia Fides) – His Exc. Msgr. 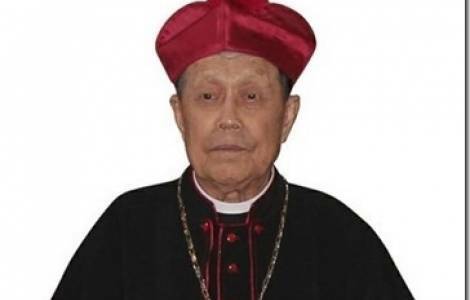 Joseph Li Mingshu, Bishop of Qingdao, in the province of Shandong (Mainland China) died on Friday, June 15 at the age of 93. He was born on December 1, 1924 in the village of Licun, Pangjiazhen, Boxing District, Binzhou City, in Shandong. In 1937 he began his studies at the Seminary of Zhoucun and ended them in Wendu Seminary in Wuhan. He was ordained a priest on 11 April 1949, he served his pastoral ministry in the parish of Shaoguan (Guangdong province) and taught in the primary and secondary school of Liqun until 1953. In 1978 he taught in a high school in the city of Boxing, Shandong, and in 1986 he served as deputy dean of Shandong Holy Spirit Seminary until he was placed in charge of Qingdao Diocese as Diocesan Administrator in 1994. On 13 August 2000 he was ordained Bishop of the diocese, with a mandate from the Holy See, from his Exc. Msgr. Ma Xuesheng, Bishop of the Diocese of Zhoucun. During the episcopal ordination rite, Msgr. Li Mingshu declared that he wanted to strengthen new means of evangelization for his diocese, forming lay leaders, developing adult catechism classes and maintaining relations of communion with the universal Church. In a letter, August 2011, on receiving the pectoral cross and ring, he reiterated his fidelity to the Pope and to the universal Church. In 2005 he invited Sr. Nirmala Joshi, Superior General of the Missionaries of Charity, to discuss the possibility of setting up orphanages and care homes for the elderly in the diocese. However, Chinese authorities did not reply to proposals about the projects.